A great variety. For fans of PBS network, the app provides many terrific video viewing options. From new to popular to coming soon, you can certainly stay in the loop. Browse through the Shows section for a particular one and then just choose the episode to begin watching. You can also add shows to your Favorites so that they conveniently display right at the top. PBS Video is an Apple TV app that allows users to access the full PBS catalog of shows and news. 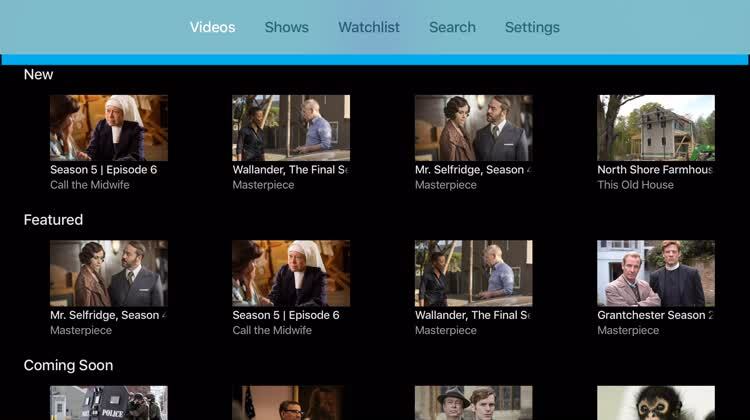 Once the app is activated, you'll be able to continue watching "Antiques Roadshow," "Downton Abbey," and much more on your own schedule, no DVR required. You'll gain access to the full library of content, add your favorites and then watch them from any device with the app. There is even some original online content that can't be accessed through the normal broadcast. So no matter how much of a PBS fan you are, there's something for everyone here with PBS Video. PBS always has some unique shows on their network, so we like having all of the content available on our schedule with the PBS Video Apple TV app. Catch up or discover recent episodes from MASTERPIECE, NOVA, NATURE, PBS NEWSHOUR, FRONTLINE, INDEPENDENT LENS, POV, ANTIQUES ROADSHOW, and so much more. The PBS Video App features thousands of full-length videos and clips from PBS and local member stations with new videos added daily. Support your local station and get extended access through PBS Passport. Explore a rich and varied selection of thousands of videos from new PBS shows and the PBS archives, as well as specially curated playlists and collections available all year long. * Get caught up in the drama with MASTERPIECE shows like Victoria, Poldark, The Durrells in Corfu, and others. * Explore new worlds with science and nature programming from NOVA and NATURE. * Shine a light on truth with news and public affairs programs from PBS NEWSHOUR, FRONTLINE, and WASHINGTON WEEK. * Take a front-row seat with arts and music content from GREAT PERFORMANCES and AUSTIN CITY LIMITS. * Learn how history shapes our present with ANTIQUES ROADSHOW and FINDING YOUR ROOTS. * Do-it-yourself by following along with THIS OLD HOUSE. * Expand your knowledge (in 10 minutes, or less) with over original series from PBS Digital Studios, including IT'S LIT, TWO CENTS, HOT MESS, AMERICA FROM SCRATCH, NOURISH, IT'S OKAY TO BE SMART, PHYSICS GIRL, ORIGIN OF EVERYTHING, SPACE TIME, and many, many more!